I've been meaning to post here for a very long time. So many meals have been made and I feel I've been greedy by not sharing them. This is something that should change. My apologies to all of you. Right now in New Orleans it's Carnival. You can read up on it on your own, but it ends in a little over a month with Mardi Gras. Starting on Twelfth Night, Epiphany, or just plain old January 6th, we can eat cake. Not just any cake: king cake. 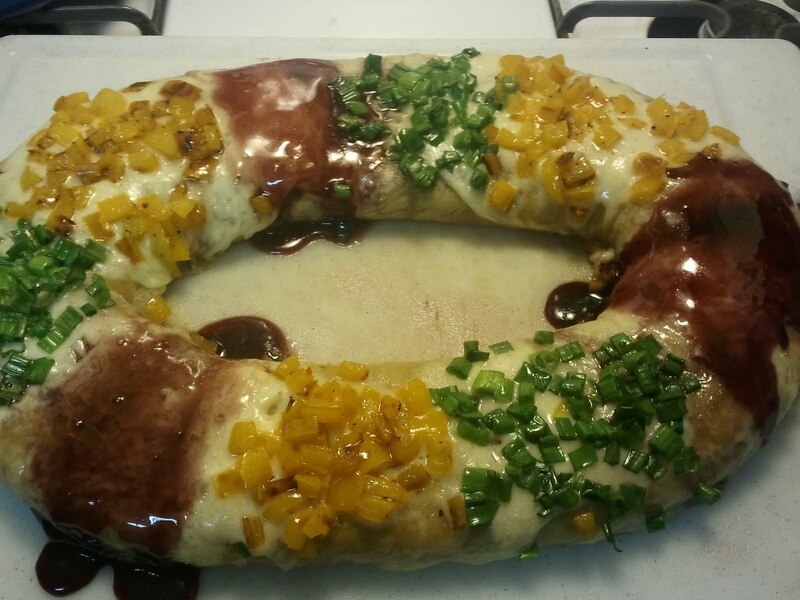 The New Orleans king cake is based off of the Rosca de reyes, gâteau des Rois, or cake of kings. Honestly, I don't know much about the history of it so I won't bore you with regurgitated Wikipedia lore. You're likely reading this on the internet, which means you can open a new tab or window and read up on your own. The important thing to remember is that Mardi Gras day becomes the last day this cake can be eaten, making it a seasonal cake. You can buy a king cake anywhere in New Orleans. Not limited to bakeries, I've seen them in grocery stores and gas stations. They come in all shapes and sizes, and also with all kinds of fillings. This is where I had a flash of inspiration. It's no secret I'm a fan of meat. I cure my own pancetta, make my own sausage, and generally love cooking meat. Pork. Beef. Chicken. All of it. Typically, whenever I look at something, I always wonder how it will taste if it is wrapped in or stuffed with meat. Sometimes it's a funny thought (seriously, who would want a bacon wrapped Snickers bar?) but sometimes it's doable enough that I can't stop thinking about. How can I stuff a cake with meat and not have it turn out gross? I started researching meat cakes and came up with mostly English recipes for what was essentially a meat loaf wrapped in dough: not exactly what I was looking for. I considered the Italian stromboli, often filled with delicious meats and cheeses, but the hard bread crust didn't seem to fit. French bread, while delicious and a perfect carrier for food, often ends up soggy if moist contents are kept in it too long (although the same can be said for any bread, I suppose). I kept my search quiet because, seriously, not the most pleasant thoughts come to mind when the average person hears the words "meat-filled king cake". I gave up on certain things: no icing, no colored sprinkles, and probably not actually cake (which would likely have the same soggy issues as a regular bread would). The answer ended up being an easy one that I feel stayed pretty true to New Orleans. One of my favorite foods is the Natchitoches meat pie. They're cheap, filling, hot, and - most importantly - full of meat. Could this be made bigger? Why not! Could it be made bigger and shaped like a ring? Sure! Can I make it look like a king cake? Hm ... a challenge. New Orleans king cakes have a somewhat "standard" look: covered in a white icing with purple, green, and yellow colored sugar all over it. While I enjoy the sweet and savory combination, icing and meat did not sound appetizing at all. 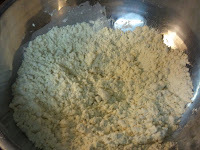 I considered mashed potatoes, as I saw done over at Black Widow Bakery's site. I instead opted for cheese, because if it's not wrapped in or stuffed with meat then it should be covered or filled with cheese. 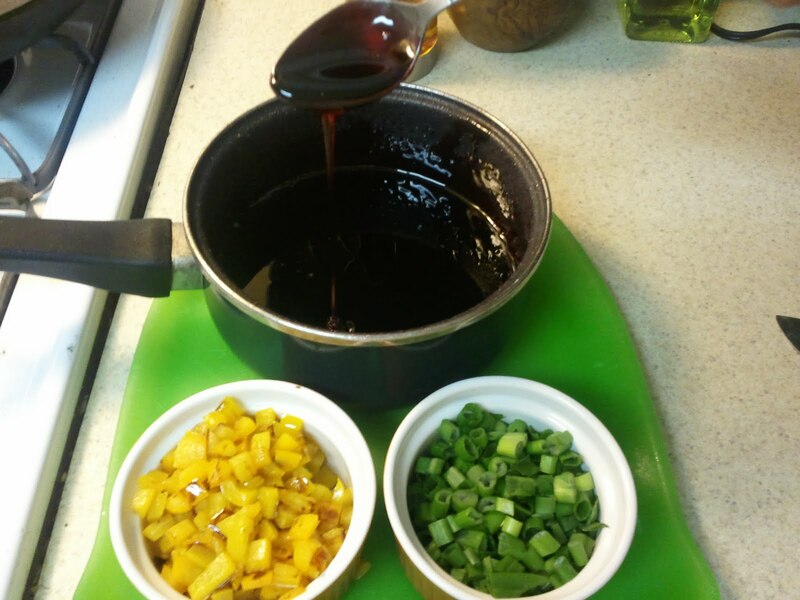 Next the colors: green onions and peppers seemed an easy choice, being part of the Holy Trinity of Cajun cooking. I considered red onion for the purple, but I was afraid that it might lose too much color in cooking (and raw onion would be a bit too harsh). A wine sauce came to mind. Actually, a wine syrup. Behold, the Gâteau de Boeuf Royale, as my boss so aptly named it. The dough is a simple suet pastry dough, made with flour, water, suet, salt, and egg. 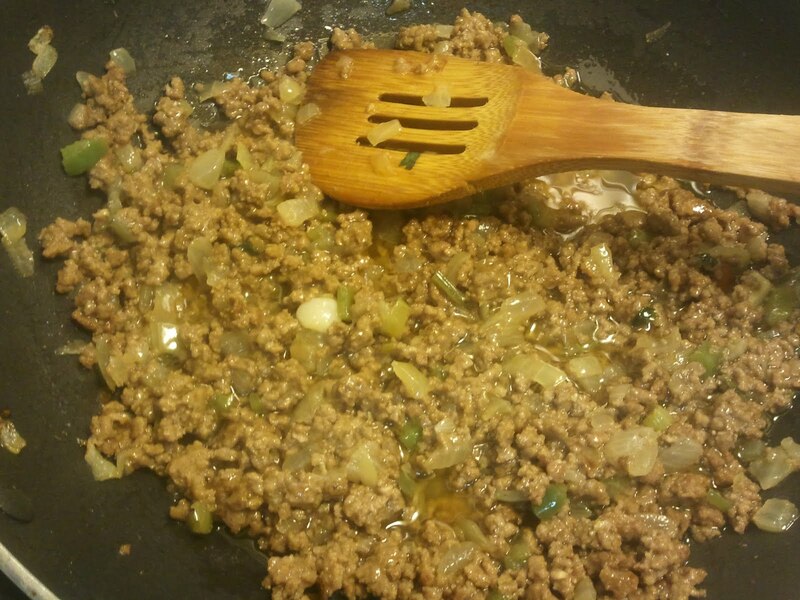 I have a ridiculous amount of ground lamb fat handy (feel free to ask why) and as it often adds a "meaty" flavor to whatever it's cooked with I thought it would work well. While that cooled, I heated up some wine and mixed in an equal amount of sugar, and set it simmer as long as it could stand it. I'm not a wine buff at all, so I grabbed some Barefoot Cabernet Sauvignon because it was cheap and I recognize the label. With the wine syrup cooking, I rolled out the dough (although in hindsight, I should have rolled it thinner) and spooned the filling down the length of it. I pinched the edges, then had a glass of wine and contemplated how best to flip it over and form it into a ring. Into a 400 degree oven it went. 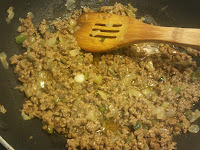 As the giant meat pie baked, I diced some yellow pepper and green onion. The yellow pepper was sauteed in the beef drippings (I obviously wasn't going for "healthy") and tossed with some of Trader Joe's 21 Seasoning Salute, which is probably the most amazing spice mixture I've ever bought, right next to Tony Chachere's. 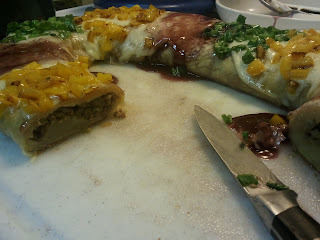 The "cake" at this point seemed cooked enough, so I layered on slices of provolone cheese, baked it until the cheese melted, then added the toppings. In hindsight, the wine syrup should not have gone on at this point: the heat melted it immediately and it just ran off onto the parchment paper. 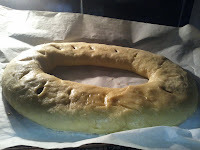 A little more time in the oven, a chance to cool, and a little more of the wine syrup ... and there it was. A meat-filled king cake. So, my wonderful neighbors, what can we take from this? Be creative and have no fear! Nothing I did here was "new". I took a bunch of recipes and smooshed them together. Luckily it turned out great! Great Post! It looks beautiful! It was sooo delicious! I want another one! Lol.